A BEAUTIFUL NIGHTTIME DECORATION FOR YOUR YARD. 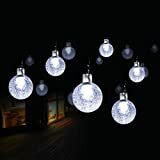 A string of white crystal ball lights you could put on a tree, fence or gazebo, along a path, around your front door, etc. EFFICIENT SOLAR CHARGER AND HIGH-CAPACITY BATTERY. A big 1000 mA battery and 200 mAh solar panels keeps these lights working for up to 12 hours on a 6-8 hour charge. EIGHT DIFFERENT LIGHTING MODES. Flashing, twinkle, waves, sequential, slow-glow, chasing, slow fade and steady on. Choose a favorite, or change the mode to suit your mood. RUGGED AS WELL AS EXCELLENT. IP65 rating means these will stand up to any weather conditions. Lighting sensor technology means the lights will light up automatically at dusk and may automatically turn off at daytime. NO-RISK PURCHASE! UNCONDITIONAL ONE YEAR MONEY-BACK GUARANTEE. If you’re unsatisfied with this item for any reason, we’ll immediately refund your purchase price. With these solar-powered outdoor lights you’ll have a great way to add beauty to your property after dark. Whether you’re decorating for a holiday or want some white string lights year-round, these LED-lit crystal ball will do the job perfectly. You get a big string of 40 lights on 13 feet of wire, with a compact solar charger and battery pack. Just set them up wherever you want and you’re done; they’ll run off the free energy of the sun. The lights come in white color and a selection of eight different modes of flashing, fading, blinking, steady-on, etc. The solar collector pack comes with a stake you can use to mount it in a sunny spot of the ground, or you can affix the pack to a tree, fence, wall, etc. unlike the easily-broken copper thread type. The lights are connected by strong wire, and even if one light goes out the rest stay lit. The storage battery is also bigger than most, at 1000 mA rather than the more-usual 600 mA. And finally, even the solar collector is better than most, with a 200 mAh capacity. Order these lights now, and we predict you’ll be back to order several more sets once you see how much beauty and cheer they can add to your property! If you want it lighting during the day, please cover the solar panel to keep it unsensible from the light. This YUNLIGHTS product is sold with a full one year money-back guarantee. If you’re dissatisfied with your purchase for any reason, contact us for a replacement or refund.